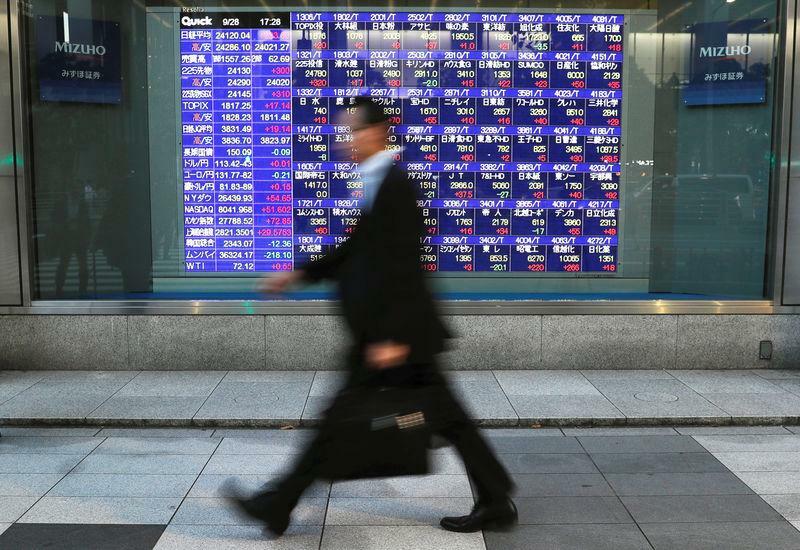 SYDNEY (Reuters) - Asian share markets sank in a sea of red on Thursday after Wall Street suffered its worst drubbing in eight months, a conflagration of wealth that could threaten business confidence and investment across the globe. MSCI's broadest index of Asia-Pacific shares outside Japan shed 2.7 percent to its lowest in 18 months. On Wall Street, the S&P500's sharpest one-day fall since February wiped out around $850 billion of wealth as technology shares tumbled on fears of slowing demand. "I really disagree with what the Fed is doing," Trump told reporters before a political rally in Pennsylvania. "I think the Fed has gone crazy." China's central bank has been allowing the yuan to gradually decline, breaking the psychological 6.9000 barrier and leading speculators to push the dollar up to 6.9380. "The yuan has already weakened significantly, to offset the tariffs announced so far," said Alan Ruskin, Deutsche's global head of G10 FX strategy. "Further weakness could exacerbate concerns of a self-fulfilling flight of capital, and a loss of control." "China buying yuan and selling dollars would likely entail some selling of U.S. Treasuries at a point where the market is showing some vulnerability, and could be very vulnerable to signs of China liquidation," added Ruskin. The euro pushed up to $1.1535 and away from a low of $1.1429 early in the week. The dollar lapsed to 112.20 yen, a telling retreat from last week's 114.54 peak. In commodity markets, gold struggled to get any safety bid and edged down to $1,192.92. Oil prices skidded in line with U.S. equity markets, even though energy traders worried about shrinking Iranian supply from U.S. sanctions and kept an eye on Hurricane Michael, which closed some U.S. Gulf of Mexico oil output. Brent crude fell 76 cents to $82.33 a barrel, while U.S. crude dropped 68 cents to $72.49.